The "Hunting Dogs" is a late added Hevelius constellation. Hevelius added this and other constellations in his sky atlas in 1690. The Hunting Dogs are a popular motif for astronomy photographers, due to its many fairly bright stars, easily recognized by the naked eye. 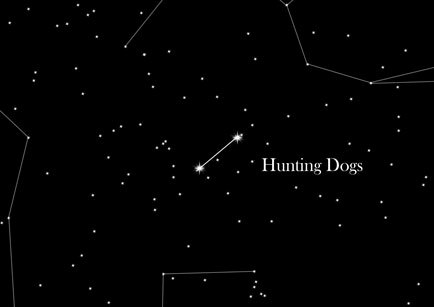 The constellation "Hunting Dogs" is relatively bright and can be seen even by the naked eye on dark nights. This constellation is full of beautiful objects - including a Globular cluster and galaxies with many interesting and binary systems. Many of these objects were already known to Charles Messier, who recorded it in his catalog. Messier discovered the Galaxy M51, a spiral galaxy 30 million light years away. The "Hunting Dogs" is a fairly new constellation. It is a so-called "modern constellation", which was recorded by Johannes Hevelius in his sky atlas. In contrast to so-called "classical constellations of Antiquity", the modern constellations were defined much later and added with no mythology about them.